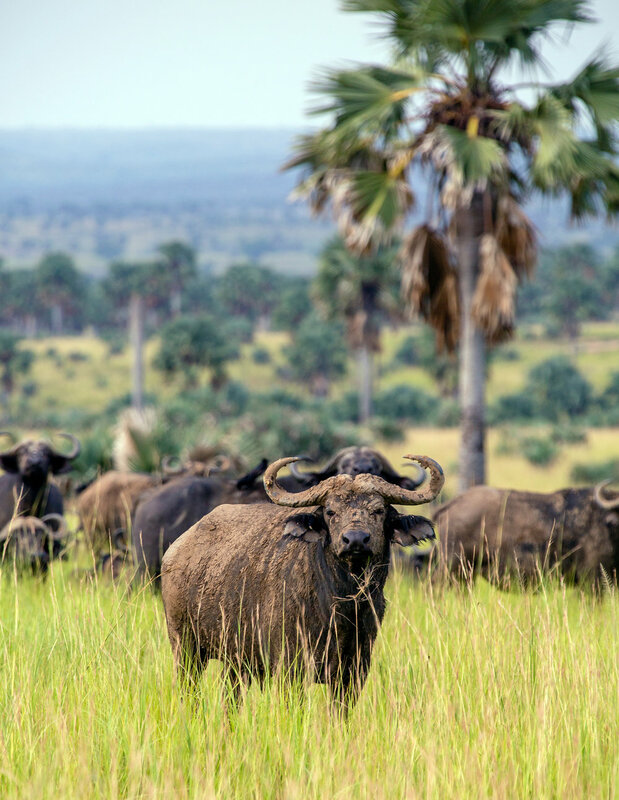 Taken in Murchison Falls National Park, Uganda. July 2018. Photo by Ben Blankenship. Many people don’t realize that toucans are opportunistic omnivores. 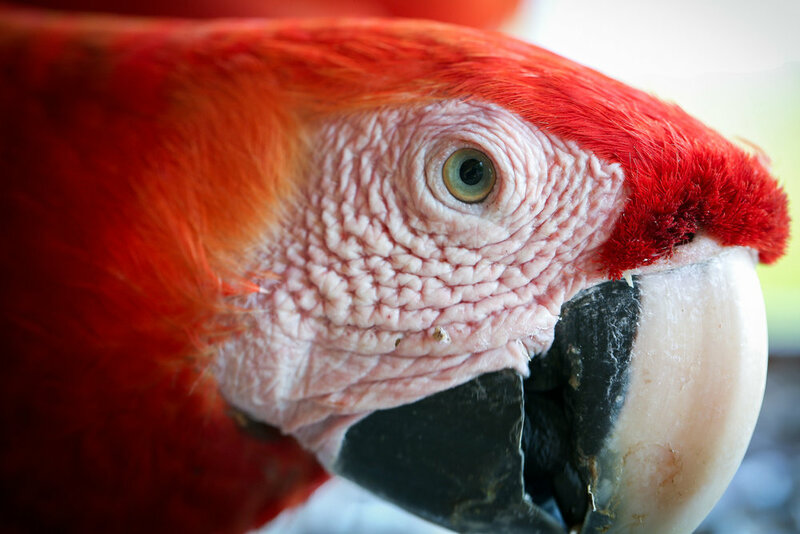 They do eat fruits and nuts, but also are notorious amongst Costa Rican locals for raiding the nests of other birds, snatching up eggs and even baby birds. Taken in Carate, Costa Rica, February 2019. Photo by Ben Blankenship. This squirrel monkey took a short break from foraging and closed its eyes for a few moments on Costa Rica’s Osa Peninsula. Taken in Carate, Costa Rica. December 2018. Photo by Ben Blankenship. This male resplendent quetzal, one of the most famous of Central American birds, sits here in an avocado tree waiting for his mate to arrive. 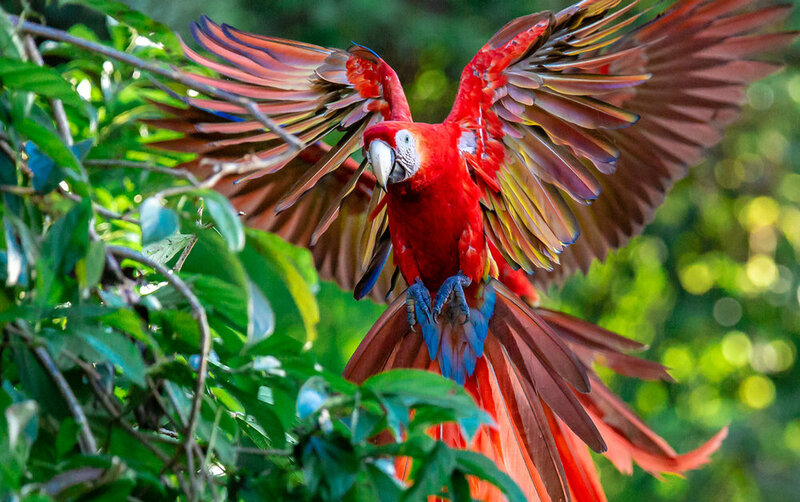 These magnificent birds adorn flags, have national currencies named after them (Guatemala), and are the subject of ancient folklore, dating back to pre-Colombian era Central America. This photo was taken in San Gerardo de Dota, Costa Rica, February 2019. Photo by Ben Blankenship. A baby white faced capuchin clings to its mother’s back in Costa Rica. Taken in Carate, Costa Rica. December 2018. Photo by Ben Blankenship. Amongst the most common of Osa Peninsula reptiles, the black spiny tailed iguana may be photogenic, but has attitude! This big male has occupied the same tree for the last two years, scaring off any rivals with that gaping mouth and aggressive head banging. Taking in Carate, Costa Rica, February 2019. Photo by Ben Blankenship. This pootoo spent nearly three weeks on this perch guarding its nest and eggs. In Spanish, this bird is known as pajaro palo, translated as “stick bird,” for its incredible camouflage. Taken on the Osa Peninsula, Costa Rica. December 2018. Photo by Ben Blankenship. This two toed sloth happened to fall asleep in a great pose for this photograph. Taken on the Osa Peninsula, Costa Rica. December 2018. Photo by Ben Blankenship. Squirrel Monkey or Forest Elf? 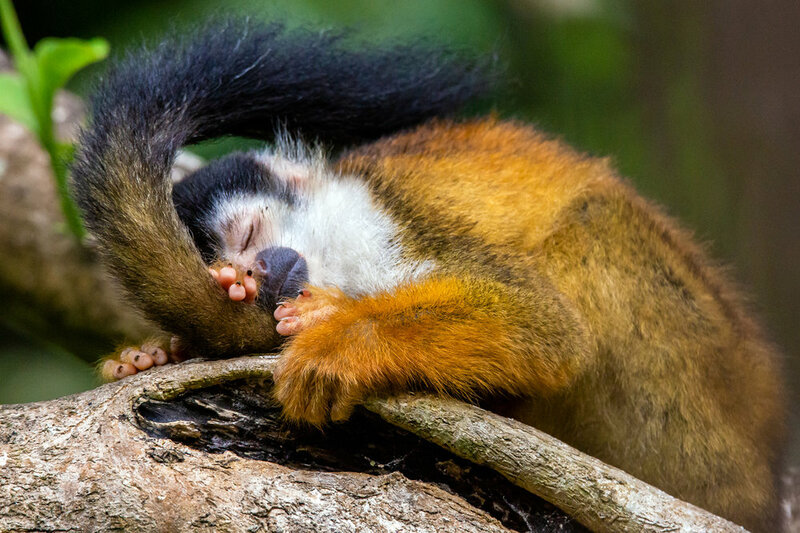 Often called the "elves of the Costa Rican rainforest," squirrel monkeys are agile, playful, and intelligent. 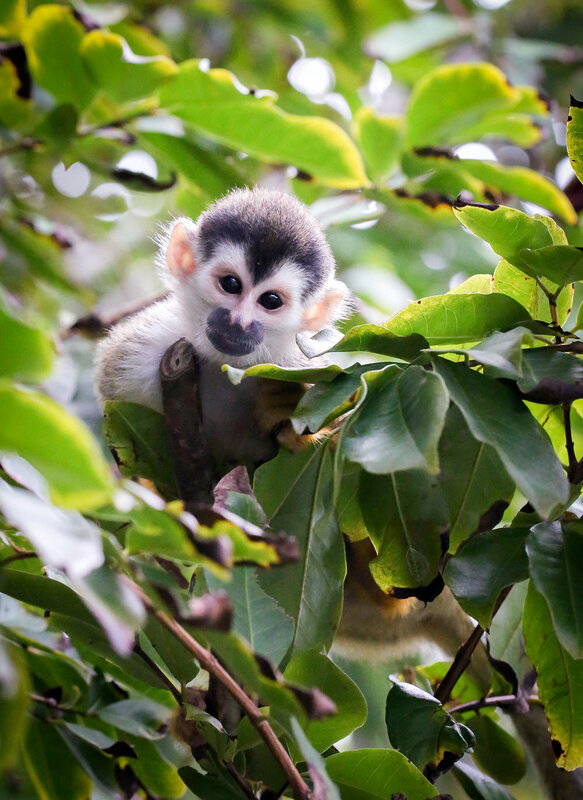 The smallest of the four primate species living in Costa Rica, it is believed that they first made their way to Central America as pets of traders and/or indigenous nomads. This spectacled caiman, a relative of the alligator, guards her muddy waterhole on Costa Rica’s Osa Peninsula. A year ago she had a brood of babies which she vigilantly guarded. This year, they’ve all grown big enough to leave their mother’s care, leaving her alone at this stream near Rio Piro. Taken in Rio Piro, Costa Rica, February 2019. Photo by Ben Blankenship. This toucan was all about making a scene on Costa Rica’s Osa Peninsula. Taken in Carate, Costa Rica. December 2018. Photo by Ben Blankenship. This White Nosed Coati paused for a moment from its hunt for buried land crabs to check out the camera. Taken in Corcovado National Park, Costa Rica. August, 2017. Photo by Ben Blankenship. Taken in Carate, Costa Rica. Photo by Ben Blankenship. March 2018. On this juvenile frog, you can see its tadpole tail still nearly completely intact, and its newly formed legs. This individual was observed on a nighttime amphibian and reptile survey conducted by the NGO Frontier in Carate, Costa Rica on the Osa Peninsula. Taken May, 2017. Photo by Ben Blankenship. Taken in San Gerardo de Dota, Costa Rica, February 2019. Photo by Ben Blankenship. Hanging from a leaf about three meters above a stream, this gelatinous frog's nest was filled with wriggling tadpoles awaiting to be mature enough to emerge from their mucous covered eggs. This was a sight we had been seeking for weeks, and to discover this nest at such a stage of development was a real treat. Observed on a nighttime amphibian and reptile survey conducted by the NGO Frontier in Carate, Costa Rica on the Osa Peninsula. Taken May, 2017. Photo by Ben Blankenship. These two granular glass frogs were observed on a nighttime amphibian and reptile survey by the NGO Frontier in Carate, Costa Rica on the Osa Peninsula. Glass frogs get their name from their characteristic translucent skin which allows them to better blend in with whatever surface they are sitting on as a defense mechanism.Taken March, 2017. Photo by Ben Blankenship. 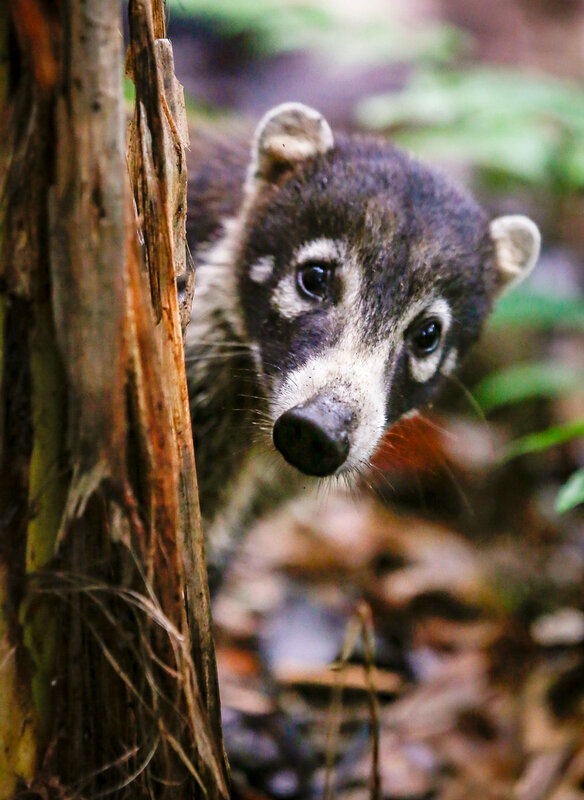 This white nosed coati was part of a troupe of around 16 individual animals that were making their way through the canopy just above the NGO Frontier's jungle camp around sunset. Taken February, 2017. Photo by Ben Blankenship. A Gladiator Tree Frog observed during a nighttime Amphibian and Reptile survey conducted by the NGO Frontier in Carate, Costa Rica on the Osa Peninsula. Photo by Ben Blankenship. This medium sized boa constrictor snuck into Frontier Base Camp's chicken coup late one night. I awoke from the sounds of distressed chickens, and upon opening the coup, I observed this boa about to strike at one of the chickens. I let the chickens out, retrieved my camera, and was able to take several photos of the snake before it slithered back into the brush, without getting a chicken dinner. Taken February, 2017 in Carate, Costa Rica. Photo by Ben Blankenship. This white faced capuchin descended low into the canopy near the Frontier base camp in Carate, Costa Rica. Taken March, 2017. Photo by Ben Blankenship. This large Smoky Jungle Frog was observed on a nighttime amphibian and reptile survey by the NGO Frontier in Carate, Costa Rica on the Osa Peninsula. Photo by Ben Blankenship. This female Golfo Dulce anole was observed on a nighttime amphibian and reptile survey conducted by the NGO Frontier in Carate, Costa Rica on the Osa Peninsula. The Golfo Dulce anole gets its name from El Golfo Dulce, the gulf that separates the Osa Peninsula from mainland Costa Rica.Taken March, 2017. Photo by Ben Blankenship. This Northern Tamandua moved through the canopy with very little grace in the lower canopy of Corcovado National Park, Costa Rica. The Tamandua have no teeth, and depend upon their powerful gizzards for breaking down their insect diet. They have partially prehensile tails which they use to help them climb and balance on tree limbs as they use their powerful claws to dig for ants and termites. Taken August, 2017. Photo by Ben Blankenship. This small headed tree frog was observed on a nighttime amphibian and reptile survey by the NGO Frontier in Carate, Costa Rica on the Osa Peninsula. Taken March, 2017. Photo by Ben Blankenship. This spider eating its prey was observed on a nighttime amphibian and reptile survey conducted by the NGO Frontier in Carate, Costa Rica on the Osa Peninsula. Taken March, 2017. Photo by Ben Blankenship. This female Geoffrey's Spider Monkey, also known as a black handed spider monkey, was observed on an afternoon primate survey conducted by the NGO Frontier in Carate, Costa Rica on the Osa Peninsula. Taken March, 2017. Photo by Ben Blankenship. This troupe of Coatis were collectively digging for land crabs when we came across them in Corcovado National Park, Costa Rica. They were incredibly bold and not skittish at all around people. Taken August, 2017. Photo by Ben Blankenship. This gladiator tree frog took a special interest in my camera flash, staring straight into the camera lens for its portrait. The gladiator tree frog gets its name from the male's characteristic barbs on its hind legs which it uses to battle other males for mating rights with females. Battles are sometimes to the death. It was observed on a nighttime amphibian and reptile survey by the NGO Frontier in Carate, Costa Rica on the Osa Peninsula. Taken March, 2017. Photo by Ben Blankenship. This Golfo Dulce anole was observed on a nighttime amphibian and reptile survey conducted by the NGO Frontier in Carate, Costa Rica on the Osa Peninsula. The Golfo Dulce anole gets its name from El Golfo Dulce, the gulf that separates the Osa Peninsula from mainland Costa Rica. Taken May, 2017. Photo by Ben Blankenship. This Geoffrey's Spider Moneky, also known as a black handed spider monkey, was observed on a primate survey conducted by the NGO Frontier in Carate, Costa Rica on the Osa Peninsula. This female is eating the tender young branches of a wild almond tree, making it appear as though she has a stogie in her mouth. Taken April, 2017. Photo by Ben Blankenship. This granular glass frog was observed on a nighttime amphibian and reptile survey by the NGO Frontier in Carate, Costa Rica on the Osa Peninsula. Glass frogs get their name from their characteristic translucent skin which allows them to better blend in with whatever surface they are sitting on as a defense mechanism. Taken March, 2017. Photo by Ben Blankenship. The Brazilian Wandering Spider, also known as the Banana Spider for its proclivity for lying its eggs in bananas, holds the Guinness World Record for being the most venomous spider in the world. It's venom is so potent that some victims die even after receiving anti-venom. Another bizarre characteristic of the Brazilian Wandering Spider's venom is its blood vessel dilating properties, which can cause men who are bitten to suffer from painful and lasting erections. This characteristic has led to some pharmaceutical companies researching this venom on the quest for the next viagra. This large and aggressive spider is very common in Costa Rica. This individual was observed on the outer wall of a cabin at Frontier's Base Camp as it consumed this young basilisk lizard. Taken May, 2017. Photo by Ben Blankenship. Of the four primate species in Costa Rica, the white faced capuchin is the crowd favorite, due to its intelligence, curiosity, and human-like behavior. They are complex creatures who can use tools and have in depth social structures. Grooming is a daily part of life for Capuchins who use it as a means of strengthening social bonds. These two juveniles were observed just outside the Frontier Base Camp in Carate, Costa Rica on the Osa Peninsula. Taken March, 2017. Photo by Ben Blankenship. Glass frogs get their name from their characteristic translucent skin which allows them to better blend in with whatever surface they are sitting on as a defense mechanism. The bare hearted glass frog is considered to be the most transparent of all of the glass frog species. This individual was smitten with the camera flash. After this image was taken, the frog jumped onto the camera lens, crawled up onto the flash, and then jumped onto my face. Taken March, 2017. Carate, Costa Rica. Photo by Ben Blankenship. This bizarre and beautiful Harlequin Beetle was observed on a nighttime amphibian and reptile survey conducted by the NGO Frontier in Carate, Costa Rica on the Osa Peninsula. Taken March, 2017. Photo by Ben Blankenship. This large gladiator tree frog was observed on a nighttime amphibian and reptile survey conducted by the NGO Frontier in Carate, Costa Rica on the Osa Peninsula. 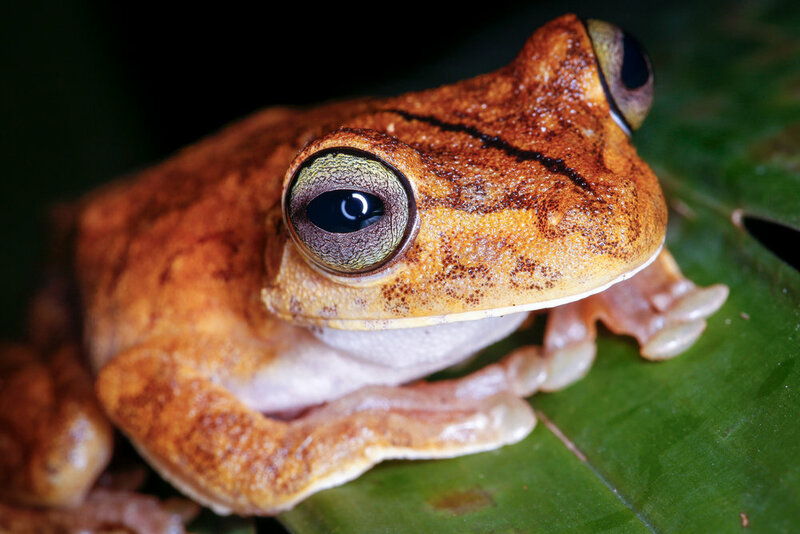 The gladiator tree frog gets its name from the male's characteristic barbs on its hind legs which it uses to battle other males for mating rights with females. Battles are sometimes to the death. Taken March, 2017. Photo by Ben Blankenship. This large grasshopper was observed on a nighttime amphibian and reptile survey conducted by the NGO Frontier in Carate, Costa Rica on the Osa Peninsula. Taken March, 2017. Photo by Ben Blankenship. Of the four primate species in Costa Rica, the white faced capuchin is the crowd favorite, due to its intelligence, curiosity, and human-like behavior. They are complex creatures who can use tools and have in depth social structures. This juvenile was observed just outside the Frontier Base Camp in Carate, Costa Rica on the Osa Peninsula. Taken March, 2017. Photo by Ben Blankenship. 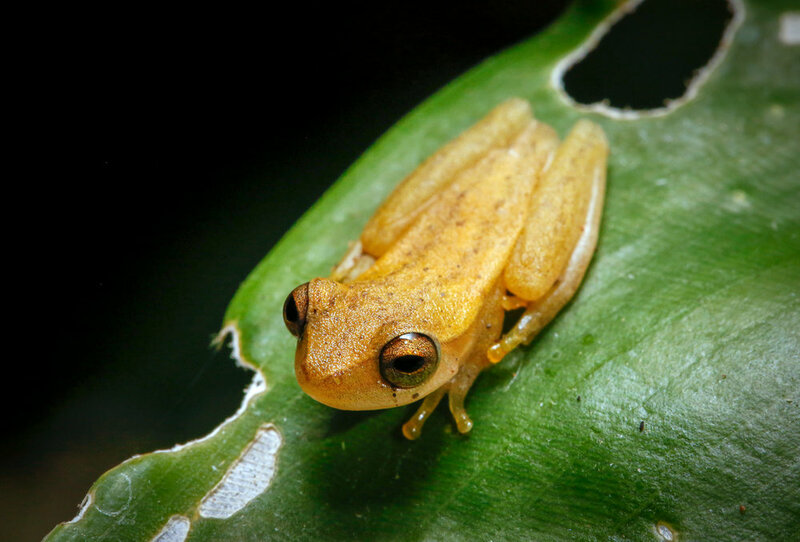 This Bare Hearted Glass Frog was observed on a nighttime amphibian and reptile survey conducted by the NGO Frontier in Carate, Costa Rica on the Osa Peninsula. Glass frogs get their name from their characteristic translucent skin which allows them to better blend in with whatever surface they are sitting on as a defense mechanism.The bare hearted glass frog is considered to be the most transparent of all of the glass frog species. Taken May, 2017. Photo by Ben Blankenship. The Golfo Dulce anole gets its name from El Golfo Dulce, the gulf that separates the Osa Peninsula from mainland Costa Rica. This female Golfo Dulce Anole was observed on a nighttime amphibian and reptile survey conducted by the NGO Frontier in Carate, Costa Rica on the Osa Peninsula. Taken March, 2017. Photo by Ben Blankenship. 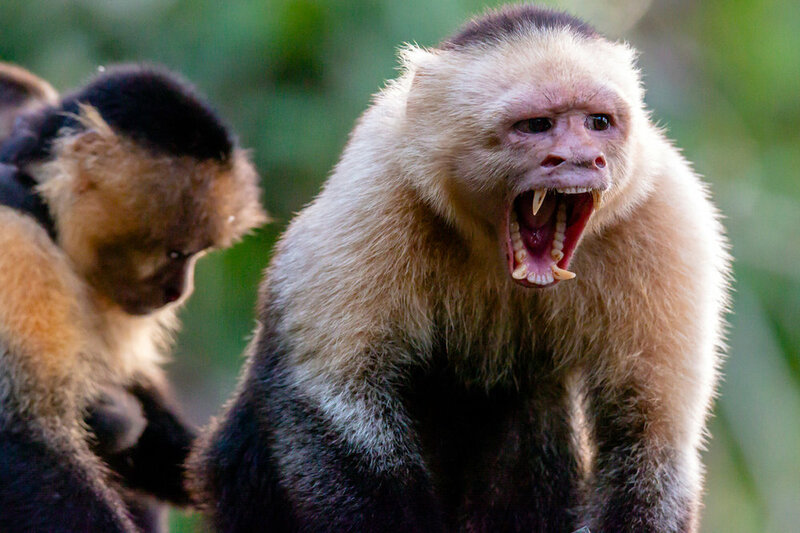 Of the four primate species in Costa Rica, the white faced capuchin is the crowd favorite, due to its intelligence, curiosity, and human-like behavior. 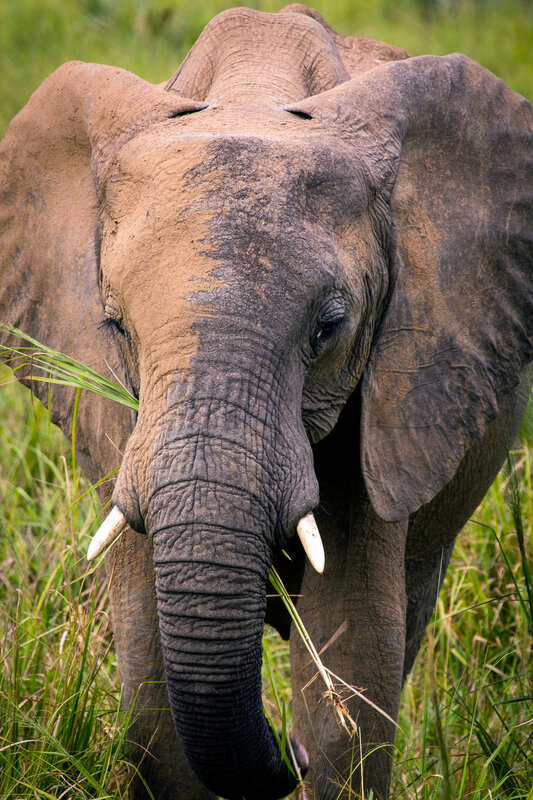 They are complex creatures who can use tools and have in depth social structures. This individual was observed as it descended from the high canopy near the Frontier Base Camp in Carate, Costa Rica on the Osa Peninsula. Taken March, 2017. Photo by Ben Blankenship. 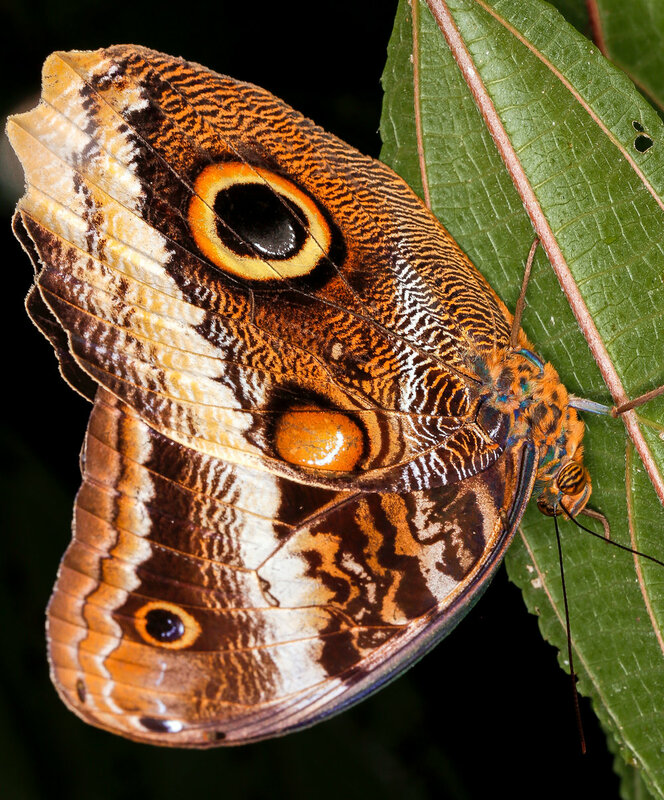 This enormous and beautiful example of an Owl Butterfly was observed on a nighttime amphibian and reptile survey conducted by the NGO Frontier in Carate, Costa Rica on the Osa Peninsula. Taken April, 2017. Photo by Ben Blankenship. The sound of this frog's call sounds very similar to the sound of an old video game laser sound effect. In fact, the first time I heard its call, I believed it to be emanating from my cell phone. 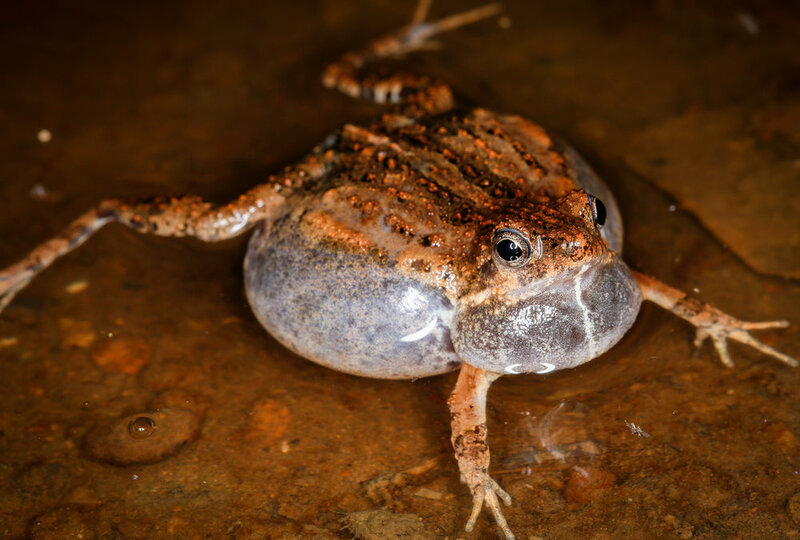 Upon research online though, we learned the calls were being emitted by the Tungara Frog, sometimes apparently nicknamed, the video game frog. 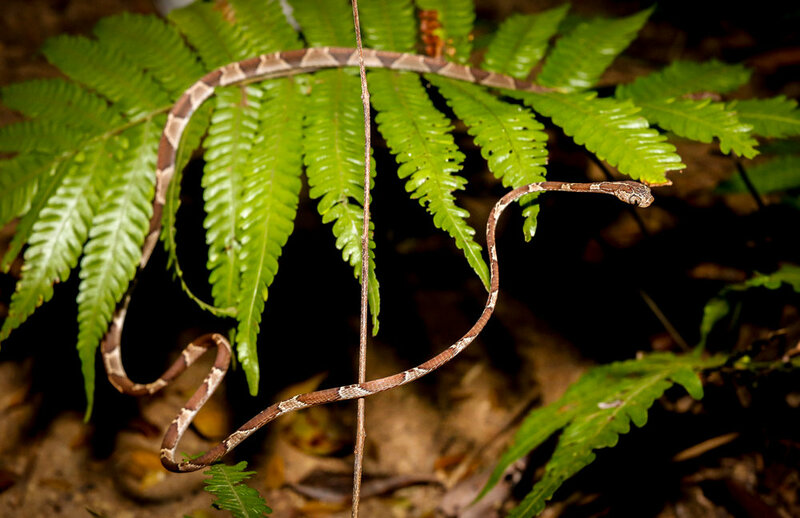 This individual was observed on a nighttime amphibian and reptile survey conducted by the NGO Frontier in Carate, Costa Rica on the Osa Peninsula. Taken March, 2017. Photo by Ben Blankenship. This very young spider monkey was very curious about my camera as we observed it and its mother in the canopy of Corcovado National Park, Costa Rica. Taken August, 2017. Photo by Ben Blankenship. The Olive Tree Frog is a master of camouflage, and can adjust its skin color from bright orange to green to mottled brown. This individual was observed on a nighttime amphibian and reptile survey conducted by the NGO Frontier in Carate, Costa Rica on the Osa Peninsula. Taken April, 2017. Photo by Ben Blankenship. As the wet season approaches in Costa Rica, the forest floor blooms with a wide array of fungi. These beautiful little bell shaped fungi were most often found growing on decomposing logs. Taken May, 2017. Photo by Ben Blankenship. This Yellow Hornet was observed on a nighttime amphibian and reptile survey conducted by the NGO Frontier in Carate, Costa Rica on the Osa Peninsula. Taken March, 2017. Photo by Ben Blankenship. The Green and Black Poison Dart Frog's name is derived from the historical practice of indigenous peoples harvesting its poison and using it to coat their darts and arrows for hunting. The very small amount of poison the frog possesses is enough to make a human heart stop beating. However, like most poison dart frogs, the green-and-black poison dart frog only releases its poison if it feels threatened. This individual was observed in Corcovado National Park, Costa Rica, on the Osa Peninsula. Taken August, 2017. Photo by Ben Blankenship. The Green Vine Snake is a rear-fanged snake, meaning it has two large teeth in the upper rear of its skull. After biting prey in the head, the snake lifts the animal 20-40 cm off the ground and emits a toxic saliva into the wound which helps immobilize the prey. This individual was observed on the beach just outside Corcovado National Park, Costa Rica. Taken August, 2017. Photo by Ben Blankenship. The highly endangered Golfo Dulce poison dart frog advertises its poisonous nature with brightly colored markings from its nose down its back. Like all poison dart frogs, Golfo Dulce poison frogs have highly potent neurotoxic poisons in their skin. While it is only the fourth-most toxic of the genus, the Golfo Dulce poison frog is still a highly toxic animal. Its poison causes severe pain, followed by seizures and paralysis if a large enough dose of the toxin is administered. 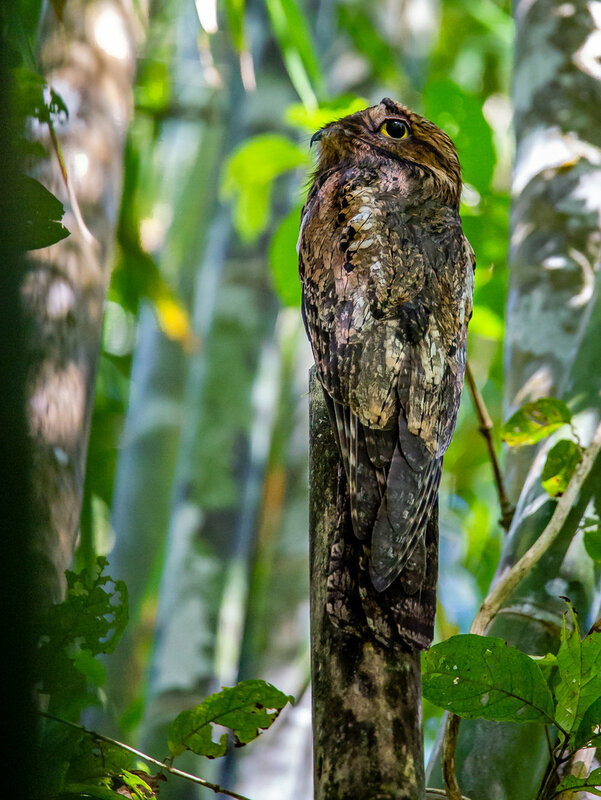 This adult individual was observed inside Corcovado National Park, Costa Rica. Taken August, 2017. Photo by Ben Blankenship. The Northern Cat Eyed Snake is a frog assassin. It's excellent camouflage and mild venom make it a perfect hunter of arboreal frog species. This individual was observed on a nighttime amphibian and reptile survey conducted by the NGO Frontier in Carate, Costa Rica on the Osa Peninsula. Taken March, 2017. Photo by Ben Blankenship. This adult Geoffrey's Spider Monkey was observed inside Corcovado National Park, Costa Rica. It's body position and "sad-looking" eyes gave me an impression of forlornness. Taken August, 2017. Photo by Ben Blankenship. The Great Curassow is a very large, pheasant like bird, which is currently listed as threatened by the IUCN Red List. It was once heavily hunted in Costa Rica for its meat, but like all terrestrial animals in Costa Rica, it is now protected from hunting. Taken inside Corcovado National Park, Costa Rica. August, 2017. Photo by Ben Blankenship. This male Geoffrey's Spider Monkey was observed leaping from tree to tree inside Corcovado National Park, Costa Rica. Taken August, 2017. Photo by Ben Blankenship. This Green Sea Turtle was observed in the tidal pools of the Big Island in Hawaii. As it surfaced, it spit water from its mouth before submerging itself again. Taken June, 2011. Photo by Ben Blankenship. This male Geoffrey's Spider Monkey was observed hanging by its tail from a tree limb inside Corcovado National Park, Costa Rica. Taken August, 2017. Photo by Ben Blankenship. This male Geoffrey's Spider Monkey was observed foraging in the the canopy inside Corcovado National Park, Costa Rica. Taken August, 2017. Photo by Ben Blankenship. This female common basilisk lizard was observed on a nighttime amphibian and reptile survey conducted by the NGO Frontier in Carate, Costa Rica on the Osa Peninsula. The common basilisk lizard earns its nickname, the Jesus Christ lizard, from its ability to run across the surface of water to evade predators. Taken March, 2017. Photo by Ben Blankenship. This Golfo Dulce anole was observed on a nighttime amphibian and reptile survey conducted by the NGO Frontier in Carate, Costa Rica on the Osa Peninsula. The Golfo Dulce anole gets its name from El Golfo Dulce, the gulf that separates the Osa Peninsula from mainland Costa Rica.Taken March, 2017. Photo by Ben Blankenship.